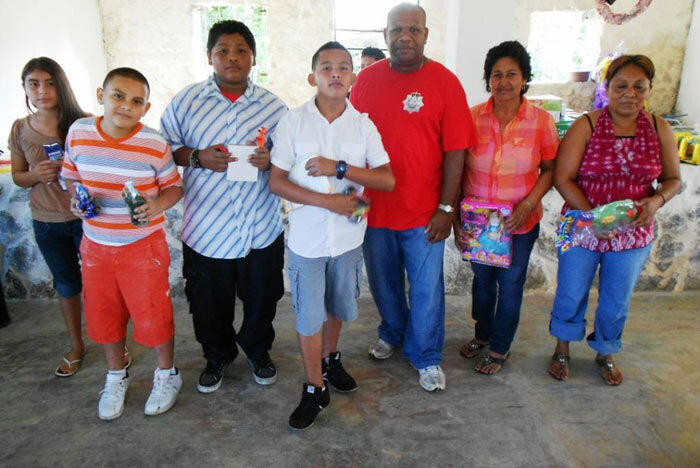 The children and families of Benque Viejo were treated to the 6th Annual Boxing Day Bash held by the Zone 4 Neighborhood Watch. This annual event was hosted and coordinated by Zone 4 Captain Samuel Bruce and was held in the spacious Sam’s Community Park. Located on his private land, Mr. Bruce has developed and made this park with a large all weather community center available for local residents throughout the year with community policing & neighborhood watch activities. 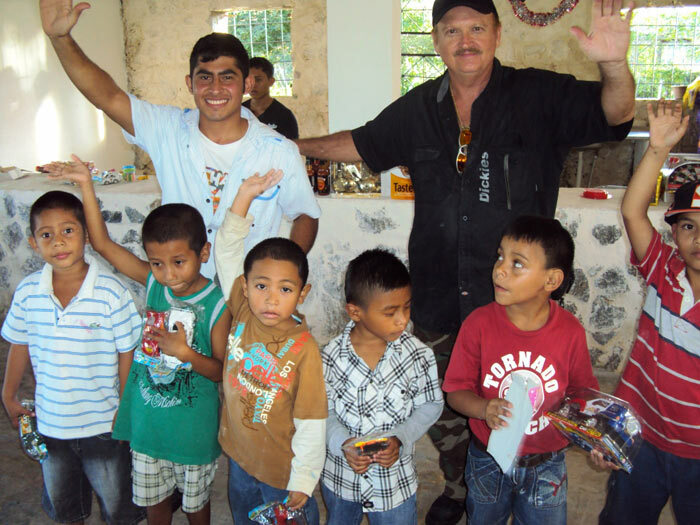 Held annually on Boxing Day, this popular event enhances Christmas by providing gifts for all the children and brings the community together strengthening the effectiveness of the Neighborhood Watch Program. Deplorable road conditions and rainy weather did not dampen the spirits for this highly anticipated event that was attended by over 500 children and adults. Many fathers were unable to attend, as they were required to travel to other parts of the country to report for work the following day but were there in spirit. Corporal McCoy of the Benque Community Policing Unit represented the Police Department and stressed to all the importance of everyone working together to report and stop crime. This attitude of corporation is one of the reasons that Benque has the lowest crime rate in the country and still practices civil society from children through adults. 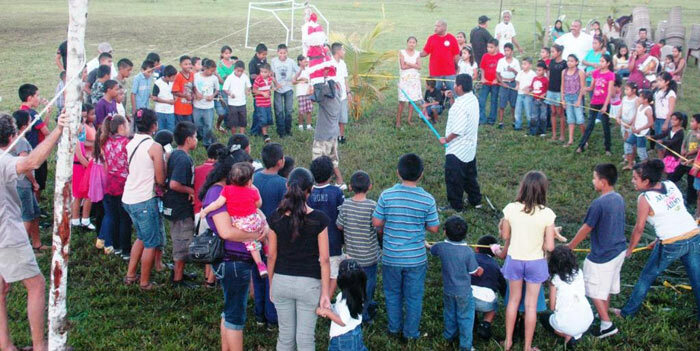 Gifts were given to all in attendance and prizes awarded to winners and participants in the various children’s games. Competitions included a question and answer session conducted by Cpl McCoy focusing on the knowledge of emergency numbers for the Police and knowledge of the Neighborhood Watch and Crime Stoppers programs as indicated on the zone 4, 2014 calendars handed out. The children and adults eagerly participated in this educational exercise. 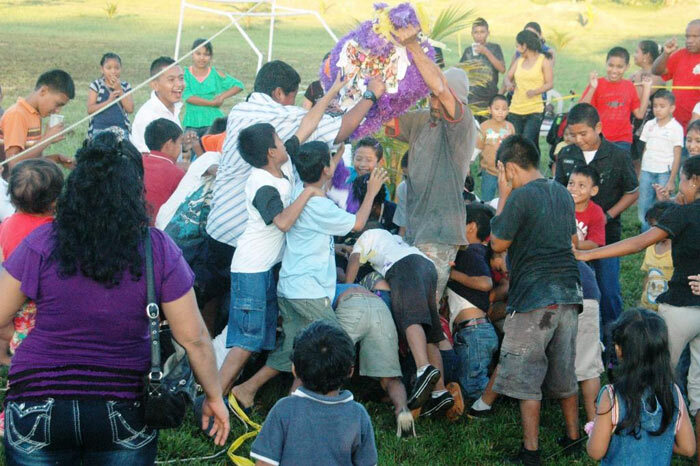 Games included Musical Chairs, Sack Race, Skip Rope, Girl’s Dance Contest, Boys Dance Contest and Football and three large piñatas packed with goodies. The audience, based on applause, judged all contests. Others chose to enjoy the playground equipment including slide, swings, volleyball and trampoline. Horchata, ideals and candy were free for all. Food and soft drinks were available. No alcohol was served. At the insistence of the audience, the Mothers had their own Dance Contest and the Grand Prize of the day was awarded to the winners as judged by the audience of predominately children. After dark the teenagers stayed until 9pm and danced to the music provided by D.J. Jair. It was a wonderful example of community interaction and good clean fun for all. Prizes included cash, dolls, cars, trucks, water guns, Frisbees, balls, schools supplies, toy tractors, jewelry, children’s vitamins, handbags, bottles of hot sauce, bags of coffee, clothes, hand tools, hats, candy, cookies, beauty care products, cereal’s, flash lights, piggy banks, agenda books, jumping ropes, toy cook ware, chess sets, and much more! This community event was sponsored by Victor Siquenza, Manuel Sosa, Sam Bruce, Edgar Contreras, Mike Campbell, Harry Moreno, Dra. Lesbia Cocom, Erwin Cocon, Jorge Espat, Social Security Board, Atlantic Bank, ICB Insurance Co., Belize Custom’s Western Border, Riemer’s Feed Mill, Benque Viejo Cable Vision, Vega’s Distributing, BRC, Econo Diesel, Caribbean Tire, Westrac, Ceiba Realty, David’s Super Store, A&R, Quality Poultry, Rocky’s Store, Crown Jewelry, Long Lucky Super Market, Central American Realty, Zhen’s Supermarket, Jimmy’s Supermarket, Benque Hardware, Caribbean Chicken, Long Lucky Restaurant, Benque UNO Gas Station, Benque Viejo Police Sub-formation, Kenny’s Store, Lin’s Supermarket, Novelo’s Gas Station, Benque Viejo Supermarket, Ruan’s Store, Jia Wang Restaurant, De Zin Grocery, Xu Guan Qi Chinese Restaurant, Happy Superstore, Hot Mama’s, Simon Store, B.J. Institute, Terry’s Store, Huyong Supermarket, Crossroads Trading, Farmers Trading Center, Cost Less Foods, Western Properties and Tres Fuegos Gourmet Coffee. Special Holiday Message from our primary sponsor Captain Bruce: "This Community Policing event is an example of families having a joyful experience in an alcohol FREE environment with Mothers and Fathers being together with their children having fun. I only wish our community had economic opportunities close by, with no need for the Fathers or Mothers to leave their families to earn a living in other parts of the country. When this is possible our social issues will lessen and our family values will grow even stronger!"